Caring for a loved one can be one of the most rewarding experiences of a lifetime. However, its demands can also lead family caregivers to become overwhelmed, anxious and exhausted - leading to burnout. The good news is that new caregiving apps, monitors, sensors and wearables are revolutionizing the caregiving experience, reducing stress, freeing up time and providing peace of mind. Here are some of our favorite new technologies to help you manage your caregiving responsibilities, lighten your load and make your life a whole lot easier! Digital assistants like Amazon Alexa, Siri and Google Home are revolutionizing how we manage our lives and access information. They can do the same for caregivers and seniors alike! Let digital assistants help you with appointment reminders, shopping lists, daily tasks and alarms – even medication reminders. without having to press a button! If you really want to free up your time, avoid the hassle of shopping and get things delivered. There’s no reason why you can’t have groceries, toiletries, household items, medications – even meal kits- delivered right to your loved one’s door by your favorite local grocer and pharmacy. It’s fast, convenient and often times free! Taking the right medications, at the right time, in the right dosages is an increasingly difficult task for seniors. With some medication regimes requiring 5-10 pills, 3-5 times daily, even caregivers can find it difficult to stay on top of things. If all you need is a gentle reminder of which medications to take and when, a phone based medication reminder app could be the perfect solution. The most downloaded medication reminder app is Medisafe, which comes with compliance reports, daily tips and discount prescription offers tailored to you. 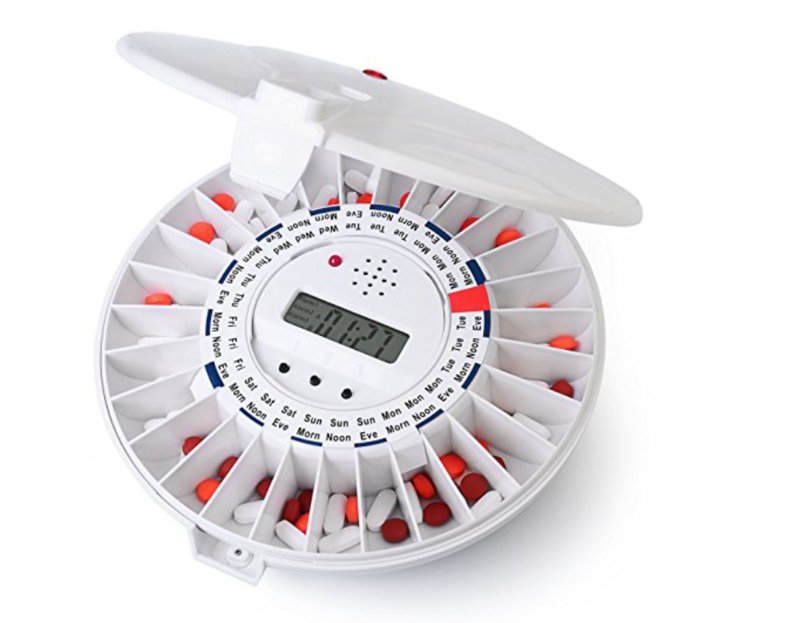 If you need a pill dispenser to manage the delivery of even the most complex medication regimens and notify caregivers when pills aren’t taken, you should explore automated medication dispensers. Falls send more seniors to the hospital emergency room than any other injury. In fact, according to the Center for Disease Control, nearly 30% of adults over the age of 65 fall every year! To help provide security and peace of mind in the event of a fall, medical alert systems can now automatically detect when you’ve fallen and send help no matter where you are using highly accurate GPS technologies – in your home or on the go. Do you ever worry your loved one will go out for a walk and forget how to get home? Does your loved one sometimes forget to tell you where they’re going, causing moments of worry and panic? A low impact way of getting some peace of mind, without inhibiting the freedom of your loved one, is to have them wear a GPS locating device. You can then track their whereabouts online without worry. If they carry a cell phone, you can also track family members by simply installing a free tracking app like Family Locator. If wandering is an issue, some GPS devices can alert you when your loved one is outside a designated area and provide you with their exact location via text, call or email. Getting seniors with mobility issues, or in remote regions, to and from medical appointments can be extremely challenging. Telemedicine is revolutionizing healthcare delivery. Why go to the doctor’s office when your doctor can use remote apps, digital pictures and video chat to monitor and diagnose everything from blood pressure to skin rashes. Doctors are even using telemedicine to monitor chronic conditions such as cancer and kidney disease from a distance. One of the biggest contributors to falls in the home is poor lighting. This is especially true in hallways and at the top and bottom of stairs, where overhead lighting tends to be poor. You can now get plug-in, or stick on, LED motion sensor night lights. Set them up once, and they’re worry free from then on. We highly recommend you place them between your bedroom and your bathroom and other highly trafficked areas. With Apple Facetime, Google Duo, Skype and other video calling technologies, it’s relatively easy to give your loved one a call and see how they’re doing. Being able to see your loved one will give you the chance to gauge their health and well being and see if they’re getting out of bed, getting dressed and changing their clothes from one day to the next. Do you ever worry that your loved one is stuck in bed? Has your loved one complained about the behavior of a paid caregiver? Remote cameras allow you to check up on the health, safety and security of your loved one at all times. In fact, you can even get remote cameras with motion detection, so you get notified when there’s movement and two-way audio so you can both speak and hear what’s going on. There are a ton of new technologies promising the moon and the stars to caregivers. However, some are better on paper than in reality. Focus on products that are simple to use, with good reviews and endorsements from family and friends. But above all, explore and see what works for you and your loved one. You deserve a smile and peace of mind!